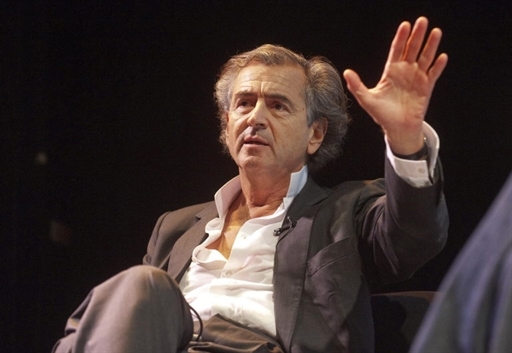 Bernard-Henri Lévy, 62, is what you can call a case. Obscenely rich, very influential and married to a beautiful actress, Arielle Dombasle, who resembles a mermaid and even has that kind of name. The International Herald Tribune just called him “the Gabriele d’Annunzio of the 21st century”. But at home, in France, he attracts violent rejection and even allergic reactions. Fact is, that after having missed somehow the Arabic spring in Tunisia and Egypt, Mr. Levy then concentrated all his efforts on Libya. He was the one who managed to get the Libyan opposition a hearing from president Nicolas Sarkozy – followed by the recognition of the Interim Transitional Council as the legitimate government of Libya by the French. We all know how this ended up: on March 17, Washington voted with France and Britain for a resolution authorizing the use of force in Libya to protect the civilian population. Levy calls the intervention in Libya “an unavoidable war”. Since then, the French press has seen him as a kind of second foreign minister. Lévy is also omnipresent in the foreign press. He gave a major interview to German news magazine Der Spiegel (here is an English version) and harshly called German Foreign Minister Guido Westerwelle “a disaster”, later he appealed for his resignation. Why do so many people still hate Mr. Levy? A lot just don’t like his “mise en scene”: the white shirts always a bit too open, the skin always a bit too suntanned, the suites always a bit too expensive. But he’s not only the “le plus beau du quartier”, the most handsome guy in the neighbourhood, as the line goes in Carla Bruni’s song of the same title (who was the one who broke up the marriage of Lévy’s daughter Justine). He’s also the conscience of France. Mr. Levy is the guy who never misses a crisis, a war or a violation of human rights. He somehow is a “public enemy”. And nobody expressed the rejection better than the writer Michel Houellebecq in their common correspondence published under the same title (Public enemies): obscenely rich, he is the “philosopher without thought, but with relations” and the “filmmaker of the most ridiculous film in film history”.